G.K. Chesterton (1874-1936) was a Christian apologist, novelist, poet, historian, biographer, playwright and author of eighty books. First a convert from atheism to the Church of England, he converted to the Church of Rome fourteen years before his death. As a champion for Christianity he lived in enviable times since he was privileged to debate on-stage some of the most brilliant and notorious anti-Christian celebrities of his day, including Bernard Shaw, Bertrand Russell, and H.G. Wells in England, and the agnostic attorney Clarence Darrow (of Scopes “Monkey” Trial fame) in America. In January of 1931 Chesterton debated Darrow in New York City on the subject “Does Religion Have a Future?” Darrow, according to at least one reporter, seemed strangely ill-at-ease and unprepared to answer some of the arguments posed by Chesterton. The audience of 3,000 was invited to vote on the winner, which turned out to be Chesterton by a margin of two-to-one. Chesterton’s Orthodoxy (1908), a call to arms to combat the poisonous rise of secularism and the decline of religion in Europe, was and still is regarded by his admirers and detractors as a masterpiece of polemical writing. The purpose for writing Orthodoxy was to answer the critics who had complained that, while Chesterton had roundly criticized the champions of Modernism in his book Heretics, he had offered no credo of his own. 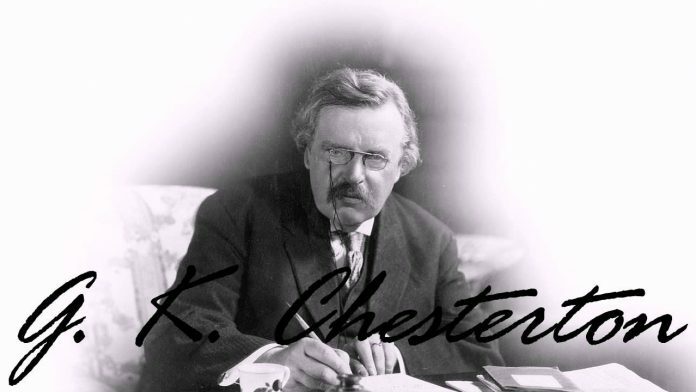 Manifestly evident throughout Orthodoxy is the fact that, written fourteen years before his conversion, Chesterton provided reasons enough to believe that he had already become a Catholic without knowing it. The central point of Orthodoxy is to explain the reasons why respect for Reason itself had collapsed and the maniacs were in charge of the modern world. Were he alive today, he would find his premise ever more bountifully proven. The maniac can easily out-reason the sane man in a verbal duel; this is because the maniac has nothing left in him but unbridled reason. He has not the virtues of wisdom, temperance, charity, etc. He is singly focused on making logical connections and following them wherever they lead. He is, in other words, the personification of all the wild excesses of modern thought. In the lunatic there is no sin, no self-searching for flaw and guilt. There is only the virtue of reason. No wonder that in a world so worshipful of reason there should be so many lunatics and so few self-conscious sinners. This inability to recognize sin is tied to the other inability to recognize spirit. Such is the posture of modern intellectuals. The materialism of the age suffers from the same narrow conceit as the notion that logic is the only path to knowing the world. But spirit is the only path to knowing ourselves. If our thoughts are material, how do we liberate them from ourselves onto a Petri dish to be examined as we might examine bacteria? Chesterton puts it this way: “The Christian is quite free to believe that there is a considerable amount of settled order and inevitable development in the universe. But the materialist is not allowed to admit into his spotless machine the slightest speck of spiritualism or miracle.” How then is it that the mind of the materialist is freer and more expansive than the mind of the Christian? Materialists and madmen are not free to doubt their own convictions. Only the Christian is free to doubt his own convictions, and he is also free to doubt the convictions of the materialists and the madmen. Chesterton indicts materialists for a fundamental contradiction. “… when materialism leads men to complete fatalism (as it generally does), it is quite idle to pretend that it is in any sense a liberating force. It is absurd to say that you are especially advancing freedom when you only use free thought to destroy free will. The determinists come to bind, not to loose. They may well call their law the ‘chain’ of causation. It is the worst chain that ever fettered a human being.” Chesterton reminds us that all these negative doctrines of materialism, determinism, skepticism, and atheism flow from this belief that one need not believe in anything so much as one’s own indomitable ego. But that is the problem. We are only truly liberated when we believe in the one Ego more indomitable than our own, the biblical I Am Who Am. Humility is an aspect of orthodoxy Chesterton has learned to admire, though he sees it wandering alone and lonely in the modern world. In the medieval world the towering spires of the churches reached up to God, an explicit concession of man’s lowliness. Chesterton sees a certain kind of humility in the modern world, but it has lost its roots. Instead of magnifying God, humility magnifies doubt and uncertainty. It makes man even smaller than he is, base in fact, just another mammal, because modern humility doubts there is a God who cares enough to raise him up. After humility, faith is needed. The skeptical attitude toward the need for religion in the modern world is truly among the most irrational of modern heresies. Just as the police are needed to obtain the public safety, so is religion needed to save us from the need for a policeman in front of every house. True, Chesterton allows, religious authority in history has sometimes been cruel and arbitrary, but how much more cruelty would there be in the world without it? Chesterton considered his belief in democracy to be another dogma of orthodoxy. It is also sometimes called the doctrine of common sense. The will of the vast majority is more often right than wrong. What Chesterton could not abide was the modern refusal to recognize tradition as consistent with democracy. “Tradition means giving votes to the most obscure of all classes, our ancestors. It is the democracy of the dead.” Of course the elites will oppose democracy, but the only way they can impose their will on the people is by opposing the wisdom of the people, which is tradition itself. Chesterton indicts the perverse thinker Schopenhauer who justified suicide. The odour of pessimism reeks when the skeptics promote suicide as a liberating experience. Christianity roundly censured suicide and came out on the side of life against death. Suicide and martyrdom, sometimes declared equivalent by the skeptics, must not be allowed the same respect, Chesterton insists. It is a rank insult to Christianity to compare martyrs who died for a cause greater than themselves with men who believe there is no cause worth living for. Christianity stepped into the incoherent mythology of the ancient world and offered an answer that was singular. God is not the Inner Light. God is not the Sun or the Moon or the Universe. Rather, God is the Creator of all that is. In one sweeping gesture Christianity devastated all the ancient gods it encountered by making sublime sense of the entire Creation. Now the duality of good and evil could be understood. God had planted man in a garden of good, and man had planted the weeds that would choke him out of the garden. The doctrine of the Fall would explain why man felt both at ease in the world and at war with it. There were abundant other complaints by the enemies of Christianity. For example, Christian theology was said to have treated women as secondary figures in the family and in society. Yet these same critics sneered at the intelligence of women, complaining that Christianity was for women (and children), not for men. Again, Christianity was accused of being too much a restraint on human sexuality; then the Church was blamed by the Malthusian malcontents for encouraging the birth of too many children. Chesterton duly noted other oddities about Christianity, until it struck him with great force that Christianity might be true because it did not shirk from its paradoxes, and even more true because all its paradoxes were simply mirror reflections of the one central paradox: Christ was both Man and God. What could be more consistently true than that Christianity was, through and through, a mystery religion, reconciling opposites with astonishing ease; and that rationalism was, through and through, merely a never-ending and hopeless maze of logical contradictions? The Pagan could think himself either the noblest or basest thing on earth, but not both at the same time. The Christian could think himself both the noblest and the meanest thing on earth. The Pagan knows it is his right never to forgive a wrong done him. The Christian knows he is obliged to forgive every offense. The Pagan might love his sin. The Christian knows he must love the sinner but hate the sin. In the chapter titled “The Eternal Revolution” Chesterton notes that Christians unsettled the ancient world because they refused to be resigned to it, as the Stoics had resigned themselves. Indeed, Christ had prophesied that the very stones would cry out, and they did when the medieval cathedrals were built and “thronged with shouting faces and open mouths.” For Christianity is not the product of a vague evolution, such as Darwin espoused, but is rather an eternal revolution against the view that the world is going forward but knows not where it is going. With all the confusion of philosophies perplexing the modern world, it is no wonder that the Catholic Church is viewed as the enemy of Evolution. It is the one thing that never changes and therefore is a challenge to the notion that everything should change and men should be kept in a permanent state of confusion. If the world is headed toward progress of the orthodox type, if we are to kill the sin rather than the sinners, the implication is that such progress must of necessity be directed by a powerful and intelligent Governor of all that is. There has to be a personal God, because if there isn’t, it makes no sense that there should have to be any progress, even by the liberal evolutionist’s standard as opposed to the standard of the orthodox revolutionist. If men are to be inevitably led to happiness, whether by the standard of the evolutionist or the revolutionist, that happiness cannot be the result of a haphazard accident of nature. Chesterton concludes that conservatism is the truly progressive ideal. If things are left to themselves, they naturally change. But they naturally change for the worse. If you leave a child to himself, his true potential will never be realized. Conservatism is not simply a matter of leaving things alone, as some people mistakenly think. “If you leave a white post alone, it will soon be a black post. If you particularly want it to be white you must be always painting it again; that is, you must always be having a revolution.” So it is that orthodoxy is always a revolt against the post turning black. So it is that the Church is forever vilified because, acknowledging the great effect of Original Sin, it insists on painting the post white over and over instead of letting it follow some natural decay (‘progress’) into blackness and rot. Chesterton saw Christianity as the moral sponsor of democracy, for it was Christianity that taught all men are equally capable of good and evil. It is the heritage and heresy of Darwinism that the rich and powerful might be viewed as the most fit to survive. In fact, the rich are to be trusted no more than the poor, so far as criminal enterprise is concerned. In fact, they might be trusted less, if we believe the parable of the camel getting through the eye of a needle. Chesterton rejected the modern liberal view that the poor are not to be trusted because they have been brutalized by poverty, and therefore must be raised up out of their poverty before they can ever be trusted. This is no more believable than that the rich got to be rich because they are morally superior to the poor, and can be trusted because they cannot be bribed. The whole history of the human race teaches just the opposite; that the rich need Christianity as much as the poor, and probably need it a great deal more, because their potential for mischief is surely greater than that of the poor. Chesterton, it is true, had many formidable critics. One of them was a contemporary, the bombastic American atheist H.L. Mencken, who acknowledged the Englishman’s genius for battle. Mencken’s grudging tribute to Chesterton is worth noting as a way of summing up G.K.’s influence on his own generation. “Not since St. Augustine have the gods sent us a man who could make the incredible so fascinatingly probable.” St. Augustine may have to make room next to him to accommodate a larger throne for the portly Chesterton whose cause for sainthood the Catholic Church began to consider in 2013. Anyone seeking a quick take on the full range of Chesterton’s thoughts, alphabetically arranged by subject matter, cannot do better than to look at The Quotable Chesterton and More Quotable Chesterton, both edited by George J. Marlin et. al.